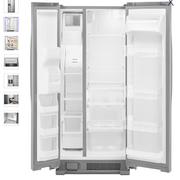 Still, this article is about organizing the freezer of an AB person. So, I’m not quite ‘there yet’. 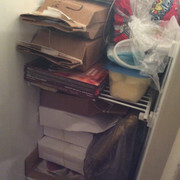 My freezer is one-third of the front of my refridgerator. Anyone SCI with really good sucess in taming their freezer, please post here! 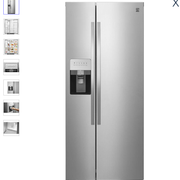 My fridge isn’t Kenmore, but is very similar to this one. See freezer on left side of refridgerator. Try to find bins that you can use as drawers then freeze things in zip lock bags. I take our extra meat,chicken and freeze them individually on a cookie sheet with parchment paper, next day I stick it into Ziploc bags they have a spot where you can write what it is and when you froze it. Depending on what you have you could freeze stuff in a cup cake tin or small bowls then put it into the Ziploc bag. I’ve saved the cardboard boxes that my frozen dinners came in. After eating the dinner, I flatten the box, then turn it inside out and glue it back together. That way, the box is either plain white or else cardboard-color. I make a latch by sewing a knob near the edge and also attaching a long string. The string wraps around the end of the box, then wraps around the knob to secure the plastic or pyrex tray inside. Now, my frozen dinners are under control. It usn’t beautiful, but I’m pleased with the improvement. Voilá, my freezer.